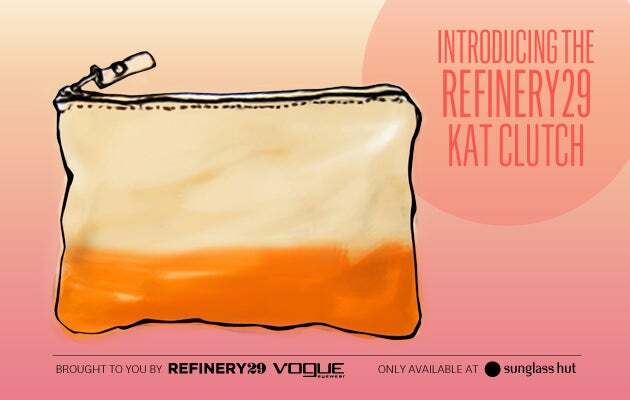 How To Get The Refinery29 Kat Clutch – Our Exclusive It Bag! We’ve finally done it, people—Refinery29 has officially created its very own It Bag! That’s right, us! As you can see, the Refinery29 Kat clutch (our first-ever exclusive bag) is not only super cute and super on-trend – it also converts from a go-anywhere purse to the world’s chicest iPad case. Sorta perfect for the world’s most stylish website, right? But you can’t just buy one of these 500 limited-edition beauties. The only way to get your hands on a free Kat clutch is to show us your true style chops: Just head down to your local Sunglass Hut, and strike a pose in a pair of oh-so-chic Vogue Eyewear sunnies. Then Instagram a pic with #ShesinVogue, or email it to ShesinVogue@Refinery29.com. The 500 most original, skillful, and stylish photogs as judged by Refinery29 will take home the Kat! Better still, by tagging your Vogue Eyewear pic with #ShesinVogue in Sunglass Hut, you’re also eligible to win a complete New York Fashion Week experience! That includes a seat at a topnotch fashion show, a weekend for two at a swanky NYC hotel, a $1,000 shopping spree, lunch with a Refinery29 editor, and a tour of your favorite site's Manhattan headquarters. All you have to do is submit a better photo than all the other Refinery29 fans —which you can totally pull off. Let's recap: To get your mitts on the newest, most-exclusive It Bag of the season and get a shot at a NYFW vacay, head to Sunglass Hut, pick your fave Vogue Eyewear sunglasses, and get Instagramming. C’mon, Refinery29 fans – show us how clutch you really are! View complete sweepstakes terms and conditions here.